Birmingham is one of the most often overlooked U.S cities when it comes to both affordable and educational fun, in our opinion over here at AST. This diverse gem of a vacation spot will give guests a great taste of history, ecoadventure, arts, and authentic local cuisine. This history here is outstanding, taking you back a few (or more) decades to the times of the iconic Sloss Furnaces here in Birmingham to the time of the remarkable and absolutely unforgettable fight for rights here in the Birmingham Civil Rights District. History isn’t the only thing making this city so great, however, because there are also several spots to shop, eat, and play within the city, not to mention admire local art, artists, and art vendors! So for the best in history, the best in education, the best in entertainment, and of course, the best in budget-friendly attractions, look no further than Birmingham, Alabama. Birmingham is a great city for student budget trips lodging-wise due to one thing: HOTELS! There is an absolute abundance of budget-friendly hotels within the boundaries of Birmingham, with every popular chain represented from Wingate and Hilton to known affordables such as Quality Inn and Residency Inn. If you have a larger student group, we suggest one of the later affordable choices. For a more memorable nighttime stay choose the Hilton Garden Inn or Westin Birmingham, more expensive but also more scenic downtown choices. This may be our favorite budget-friendly feature of Birmingham overall, the transportation situation here really on par with student/group needs. The city owns a public shuttle and bus system known as the BJCTA MAX, Birmingham’s premier public transit system. The city has actually always heavily been involved in improving transportation quality, beginning over a hundred years again with the 1884 Birmingham Railway CO. MAX started here first in 1999, becoming the top paratransit system for over 400,000 people, giving over 3 million rides a year. **Single ride fares run guests $1.25, a convenient two-hour pass is only $1.50. Birmingham, as mentioned before, is mostly well known for their civil rights history, but that doesn’t mean they don’t have plenty of other great things to do here! Wildlife, local horticulture, and tons of great education and entertainment await! This is your opportunity to let loose and have a little (wet) fun! Learn, play, and ensure your group has a really great time at McWane! These are our top two choices for group dining in Birmingham, just trust us on this one! Shop till you drop here at the Summit, the best local spot to get your retail therapy on. There are also several different free things to do while visiting this city, the cherry on top of it all when it comes to reasons why this spot is so budget-friendly! Beauty, eco-education, and a peaceful spot to soak in the more natural side of Birmingham. Get out and get active, this is the perfect spot for it. No visit to this iconic Civil Rights city would be close to complete without a stop here, that's for certain. 16th Street Baptist will make a great first stop, history and culture abound within those walls. Unbelievably rich in culture and talent, this is one of the finest collections in the U.S, and it's free! 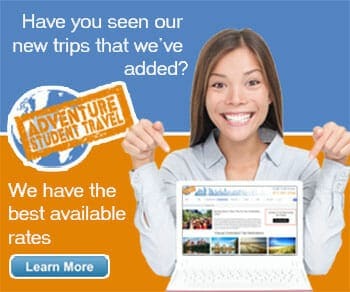 For more great Student Budget Trip Ideas click below.